As I mentioned in my last post, Why You Should Plan Your NaNo in Advance, I believe planning the key elements is a fool-proof way to develop a novel that is big enough to last 50,000 words, and offers you the best inspiration to make it to the end of the story before November is over. Here are my 11 steps. Other writing instructors use from 4 to 22, but these are the ones I use for every single story I write: novel, novella, even a short story. Some of these concepts may already be familiar to you, but the book and worksheets offer a how-to technique to help you put the theory into action–into your words on paper or pixel. Premise is a concept that comes from screenwriting. In Hollywood, studios and producers want the whole story summed up in a single sentence. Everyone is Hollywood busy, and apparently they don’t have time for a whole paragraph, much less a page about the story. The advantage of developing a premise sentence is that it forces the writer to get to the point, to boil the story down to its pure essence. I have a set of brainstorming exercises to choose a set of characters, conflicts, and circumstances first, then help you develop the draft premise. I’ll help you revise and refine your premise as we work through the worksheet and planning exercises to develop the larger themes. We’ll take a look at the main storyline and see whether it’s enough to develop into a novel-length story. If not, there are ways to add interest and secondary plotlines. If you find the premise is lacking after working through the next set of exercises, it’s probably more suited to a novella-length or possibly even a short story. Keep working and we’ll get your NaNo premise whipped into shape. SECRET: Once you develop a set of character traits, needs, wants and goals, your characters really will come alive and start writing much of the plot for you. It takes the pressure off you, and it keeps you from trying to make them jump through hoops that don’t work for the character. Once you settle on a character arc, overlay the needs and wants, and you’ll have a robust premise that makes the plotting easy. It’s as simple as knowing how the weakness keeps the character from his goal, and how he will be challenged along the way until he over comes the weakness. Does your villain should have his own set of needs, wants, strengths and weaknesses? Selecting an interesting and appropriately matched opponent for your hero and his goals is the key to keeping tension and conflict high. We’ll discover the villains own strengths and weaknesses, where he overlaps with the hero, how he pushes the hero’s buttons, and how the opponent actually drives the hero’s resolution. Do you know who the main opponent is in a romance? Check out the worksheets or the full book for how to build a satisfying conflict and just the right amount of tension between your main characters. This is one of my favorite parts of planning. The character web sets up a cast of supporting characters based on how they interact with the hero and the opponent. Some characters are allies, others opponents, some are both. With a romance, if you have a character who is an ally to one main character and an opponent to the other, it really adds another level of complexity to the story, and a lot of fun to the planning and writing process. I’ll help you select a set of characters who create and exacerbate conflict and tension where the story needs it. And these are the same characters who will be pushing the hero through his arc to the resolution of the novel. Directly from Smooth Draft. Also available from Amazon, Smashwords and ARe/Omni. Or read free with your Scribd subscription. Download the FREE Worksheets here. In other words: what the hell happens in the middle? Beginnings are usually easy, when your energy and creativity are high. Endings, well, if you get that far, you think you’ll figure it out. But how to get through the soggy middle? We’ll plan how the hero tries to achieve his goals while escalating the tension until we hit the next turning point. This is the point then it looks like all is lost. He’ll never get what he wants, and certainly not what he needs (if he’s even figured that out). Throw the worst at the hero and he’ll tell you how he’ll deal with it—if you’ve set up his strengths, weaknesses, and traits, you know what that worst will be and how he’ll turn everything around. We’ll make sure to put the conflicts in the correct order so this really is the darkest day. Like Step 8, this all depends on how you’ve developed the character, not the plot points. If . What follows on Step 9? How does the hero’s world look after he’s overcome his weakness, his opponents and figured out who or what he should be? You still have options here, and will work through some of the possibilities, and how to resolve the story after the self-revelation. After we have planned out the major elements of the story, we’ll refine the premise. You’ll get a lot of mileage out of your premise. It masquerades as an elevator pitch if you happen to run into a publisher or agent. It also works as a logline or tagline you can even put on your book cover. The cool thing about a premise is that while it tells you what happens, it doesn’t give away any plot spoilers. In fact, a good premise isn’t about the plot at all. That’s why planning your story doesn’t stifle your creativity. It’s not about what happens at the micro level. It’s about the larger themes and character transitions, which is what will attract your readers in the first place. I hope you’ll find my planning process useful. I’ve employed it for every book I’ve written for the past couple of years, and it has allowed me to write more quickly and waste less time wondering what should happen next. I also create more interesting and layered characters than ever before. 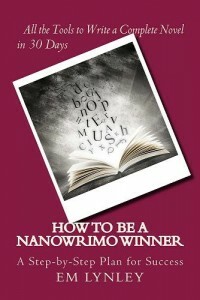 I’ll be offering some tips during November about planning and using my story planning worksheets, but if you want all the information and techniques, pick up a copy of How to Be a NaNoWriMo Winner. Available directly from my website, Amazon, Smashwords and ARe/Omni. Very helpful. I’m heading to Amazon to check out the book.